CD800 with Lamination Create longer-lasting ID cards that better resist forgery and alteration. The Datacard® CD800™ card printer with inline lamination module helps you protect your ID cards from abrasion, chemicals, daily wear and tear – and fraud. CD820 The Datacard® CD820™ instant issuance system offers tough security and versatile printing and encoding options. When combined with CardWizard® software, it can help support an instant issuance program that will capture more business, improve card activation rates and reduce issuance costs. CP80 Plus The Datacard® CP80™ Plus ID card printer delivers unprecedented security and durability for ID programs in government agencies, high-tech corporations, universities and other security-minded organizations. Rely on this powerful printer to issue technologically advanced IDs that protect people, facilities and other critical assets. FP65i The Datacard® FP65i™ financial card printer instantly issues new and replacement credit, debit and gift cards, minimizing cardholder wait-time and reducing the risk of lost or stolen cards. On-demand issuance is an ideal way to expedite card usage, increase cardholder loyalty and help reduce operating costs. SD260 The Datacard® SD260™ card printer puts value right on your desktop. Save time and increase workday efficiency with this best-in-class card printer, ideal for many ID card issuance and badging applications. SD360 Bring even more value to your desktop with the Datacard® SD360™ card printer. Increase productivity and save work time by issuing secure, two-sided ID cards and badges with this best-in-class card printer. Ideal applications include small- to medium-sized businesses, schools, clubs and hospitals. SD460 As counterfeiting and alteration attempts have grown more sophisticated, so have the card security features that let you easily verify identity and authenticity. The Datacard® SD460™ card printer delivers everything you need to increase the security and durability of your ID cards. With this reliable, all-in-one printer, encoder and laminator, you can add unique personalization features and secure overlays to help resist fraud. Plus, you can produce cards that last longer, helping you avoid costly re-issuance. SP25 Plus As the most affordable ID system in the SP Series line, the Datacard® SP25 Plus card printer is a smart choice for producing a variety of attractive photo ID cards or badges comfortably within your budget. This simple, flexible printer offers full-color and monochrome capabilities as well as rewritable card printing that reduces the time, cost and waste of reissuance. SP55K Developed exclusively for integration into kiosks, the Datacard® SP55k kiosk card printer delivers an attractive combination of proven reliability, high-quality card printing and the ability to integrate smoothly with a variety of kiosk designs. To help kiosk integrators even more, it has low maintenance requirements and is very easy to use. SP75 Plus Choose the Datacard® SP75 Plus card printer to protect people, facilities and critical assets in government, corporations, universities and other organizations that require high security. This powerful and versatile printer issues technologically advanced IDs that maximize card security and durability. CR500 The Datacard® CR500™ instant issuance system—integrated with Datacard® CardWizard® issuance software—delivers the consistency, reliability and security you need to issue ready-to-use, flat financial cards on-demand. This powerful, yet user-friendly system is ideal for banks, credit unions, retailers and service bureaus looking to provide cardholders with highly customized cards, immediate buying power and enhanced service levels. FCP 20/20 The Datacard® FCP 20/20 Financial Card Printer lets you issue high-quality ATM, debit, credit and prepaid cards instantly. With onsite issuance, PIN selection and card activation, cardholders receive instant gratification, as well as instant buying power. 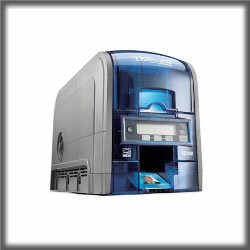 SR200 The Datacard® SR200 retransfer card printer gives cost-conscious issuers an affordable way to issue single-sided cards with high-quality, full-color images. It enables over-the-edge printing on a variety of materials, and can be configured with an optional laminator. SR300 The Datacard® SR300 retransfer card printer allows cost-conscious issuers to produce high-quality, full-color, dual-sided cards efficiently and affordably. This compact printer enables over-the-edge printing on a wide range of materials. It can also be configured with an optional laminator. ID Works Produce high-quality cards simply and securely with ID Works® identification software. You'll enjoy the features, functionality and scalability needed to seamlessly create card and report designs, production forms and databases. This flexible, powerful platform comes in four unique editions: ID Works Visitor Manager Datacard® ID Works® Visitor Manager software registers guests with a single scan of a government-approved credential, such as a driver’s license or passport. It automatically imports the cardholder’s name, photo and other details, so you can print a visitor ID quickly and cost-effectively — without keying in any information. ZXP Series 8 Increase operational efficiency and lower costs without sacrificing image quality. This card printer lets you create on-demand picture-perfect plastic cards. ZXP Series 8 Secure Issuance Improve customer satisfaction and reduce card program costs with a credit card printer that instantly and securely prints and encodes high-quality financial cards. ZXP Series 7 The ZXP Series 7 is Zebra's highest performance printer for any direct-to-card printing application. ZXP Series 7 with Laminator The ZXP Series 7 offers a single- and dual-sided laminator option. Zebra's patented wasteless laminate design reduces waste and lowers costs by eliminating the need for carrier material, backings and liners. ZXP Series 3 Make professional ID, gift and loyalty, and financial cards with ease right from your desktop with a reliable card printer featuring fast print speeds and high-quality imaging. ZXP Series 3 with Security Enclosure The ZXP Series 3's optional card enclosure lock and obscured output bin are ideal for higher-security environments and card printing applications. ZXP Series 1 Ideal for low-volume, single-sided card printing applications in color or monochrome, the ZXP Series 1 offers a complete card printing solution with a minimal upfront investment. Quick-Card ID Standard Solution These innovative ID card printers give you everything you need to quickly, easily, and cost-effectively make professional-quality ID cards. Quick-Card ID Professional Solution Developed for larger organizations, create high quality professional-quality identification cards with Zebra's QuikCard™ Professional Photo ID Kit . The kit includes an upgraded Photo ID camera, CardStudio Professional software, Portable Photo ID backdrop and sample cards to create high quality cards. A Zebra card printer must be purchased separately.